The Russian Consulate General in the Yemeni sea port of Aden has been damaged during airstrikes launched by the Saudi-led military coalition against the Houthi rebels, said a source in the Russian embassy in Yemen. “There is not a single intact window left,” the source told Sputnik. A possibility of consulate closure and the evacuation of Russian nationals is currently under review, the source added. Earlier on Wednesday a Russian plane charted for the evacuation of Russian citizens caught in the conflict had been diverted to Cairo, after the coalition denied it landing in the Yemeni capital Sanaa. The evacuation has now been delayed until Thursday, when the chartered flight “accompanied by two other aircraft” is expected to arrive in Sanaa, according to a source of Russian daily Kommersan. In addition to Russians, the aircraft will also help to evacuate the citizens of the Commonwealth of Independent States, the source added. 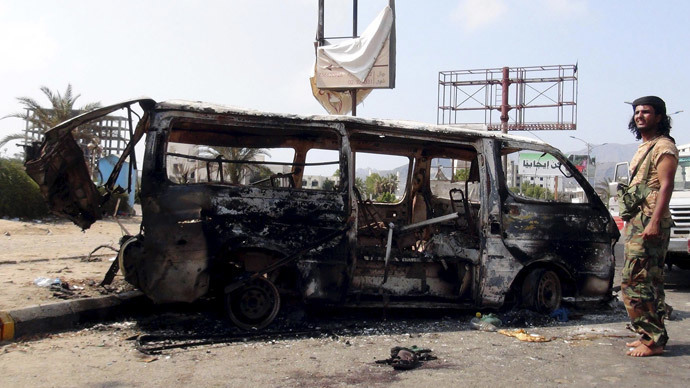 On Wednesday, Houthi rebels have reportedly take control of the Presidential residence in Aden after violent clashes that killed 15 and injured dozens. “Houthis have taken control of the presidential residence, clashes are taking place around the residence between Houthis and armed groups that support President Hadi. Civilians who have answered the call of [Yemeni] Foreign Minister Riyadh Yaseen to protect the city and restore control over the residence are also taking part in the clashes,” a local source told Sputnik. Meanwhile Egypt has begun the evacuation of its citizens from Yemen either through border crossings or by sea in a coordinated effort with Oman and Saudi Arabia, the country’s foreign ministry said. India, in the meantime, sent a vessel “into barrage of bombs” in Aden, to evacuate 349 of its nationals to Djibouti and then fly them back home. Last week, five Gulf states and Egypt launched a series of airstrikes against the Shia Houthi rebels, who had gained control of the capital and large swathes of territory in the west of the country. In addition Jordan, Sudan, Morocco and Pakistan declared their willingness to participate in the military effort.Neighboring Saudi Arabia, has taken full control of the country’s air and sea ports, purportedly to prevent the inflow of weapons from abroad. The Yemeni government, now in exile in Saudi Arabia, has been insisting that the coalition should launch a ground operation against the rebels as soon as possible. “Yes, I’m calling for this because I think at some stage air strikes will be ineffective,” Riyadh Yassin told AFP in the Saudi capital, where he has taken refuge along with President Abedrabbo Mansour Hadi.